The tiny Abacos Islands cover 649 square miles (1,681 sq km) and form the most northerly part of the Bahamas. Located only 200 miles (322km) from Miami, they are a popular holiday destination, and therefore fairly well developed for tourism. The two main islands, Great Abaco and neighbouring Little Abaco, are separated from each other by a narrow strait. They are often tagged the 'Loyalist Isles' because of the English supporters who fled there to avoid persecution after the American Revolution. The early Loyalist settlements can still be seen in their well-preserved finery on Green Turtle Cay and Elbow Cay. As for modern settlements, visitors will find themselves in quaint cottages by the sea or in beautiful guesthouses near the marinas, as opposed to the mega-resorts seen elsewhere in the Caribbean. The sheltered waters around the islands make it a hotspot for yachters, and Man-O-War Cay is famous for its local boatmakers. On the opposite end of the spectrum, coral reefs entice divers and inland pine forests provide wonderful bird-watching and walking opportunities, and it's these things that make these islands special. The Abacos Islands avoid the typical package-holiday rush and only draw travellers who are curious and adventurous at heart. 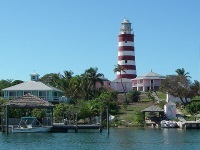 Finally, the lighthouse in Hope Town is a good way to round off any trip to the Abacos Islands.